I was craving some carrot cake, but I didn’t want to bake a huge multi-tiered cake for our drive out to Palm Springs for the weekend. Imagine that in the trunk on a 3 hour car ride! Being a family with food allergies, I cook and bake everything. We always stay at a hotel with a kitchen, when available, or stow our food in the hotel kitchen (yep, lots of planning). So I thought a simple carrot cake, still in it’s pan, and frosting on the side should be just fine. And it was the perfect traveler. I don’t know if I can say that about my kids, well I guess they were for 2 out of the 3 hour car ride. After dinner we had some of this delightful cake, frosted as thick as can be. This frosting beats any bottled stuff, thanks to Daiya cream cheese! When you try this stuff you will pile it on too. This cake is as moist as it gets. Who the heck said gluten free, dairy free, and egg free can’t taste this good?? I challenge them to a carrot cake duel. Grease a 9×13 inch baking dish. Line with parchment paper, then grease and flour the pans. I use Earth Balance Soy Free Spread. Coconut oil or palm shortening work well too. In a medium bowl, sift together 3 1/4 cups gluten free flour blend, 1/4 cup flaxseed meal, cinnamon, baking soda, and salt. Set aside. In another small bowl toss the pecans with the 1 tablespoon white rice flour. Beat the sugar and oil in the bowl of an electric mixer fitted with the paddle attachment for 2-3 minutes. It will appear shiny and sugar granules have been well incorporated into the oil. In a small bowl combine 3 tablespoons of the flaxseed meal with 2 tablespoons of hot water and 2 teaspoons of the oil. Stir well. It will appear like a thick gooey paste. Add the the mixer and continue to mix. Add the vanilla. Add the dry ingredients to the wet ingredients. Fold in the carrots and pineapple. 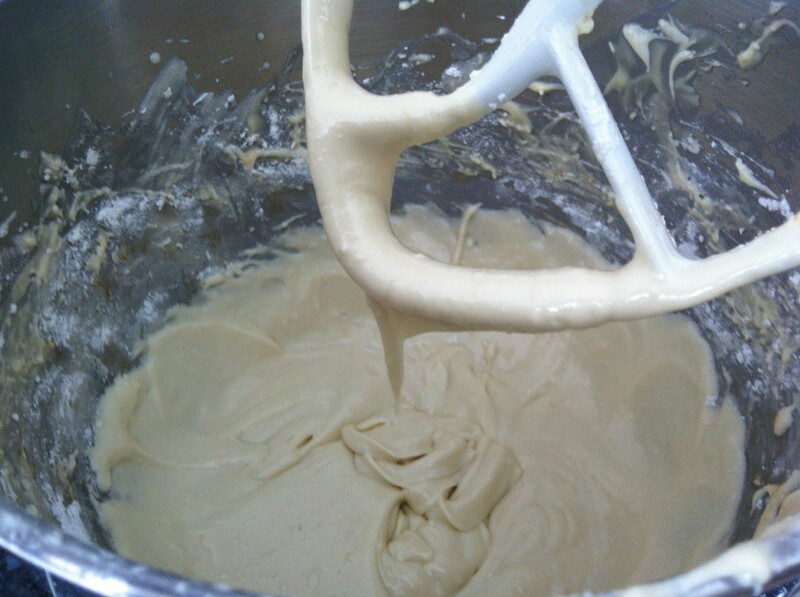 Add to the batter and mix well. Reduce the mixer to low and add the floured pecans, mix until combined. Transfer batter into the baking dish. Bake for 40-45 minutes, or until a toothpick comes out clean. Allow the cake to cool in the baking dish for 15-20 minutes before transferring to a wire rack. 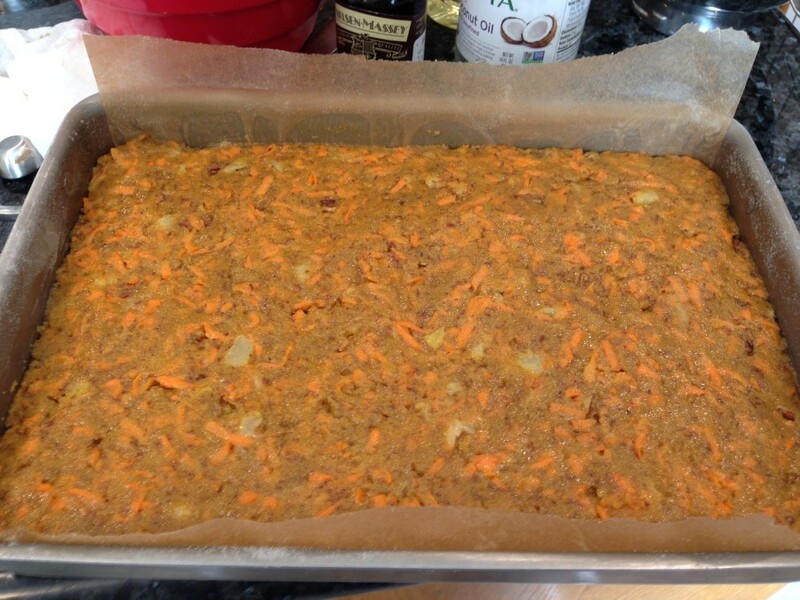 And here it is out of the oven, do you see those lovely specks of pineapple and carrot? Yum! Mix the cream cheese, shortening and vanilla in the bowl of an electric mixer on medium high speed fitted with the paddle attachment until just combined. Reduce to low, add sifted powdered sugar. When combined increase speed to medium, and mix until smooth. With an offset spatula or knife, spread the cake with frosting. Cake can be made up to 2 days in advance sealed in plastic wrap and refrigerated, frost before serving. Frosting will refrigerate well for 2 weeks in an airtight container. This looks divine with all the carrots you added. I need to make this, thank you for your detailed recipe. This looks so yummy! I cannot have pineapple, any substitutes you recommend? I want to make this on the weekend. Hi Trudy, Mango! I have made it with mango and it is just as good! I would like to make this with eggs. Which ingredients to I omit? You can omit the flax and hot water to replace with 2 whole eggs. 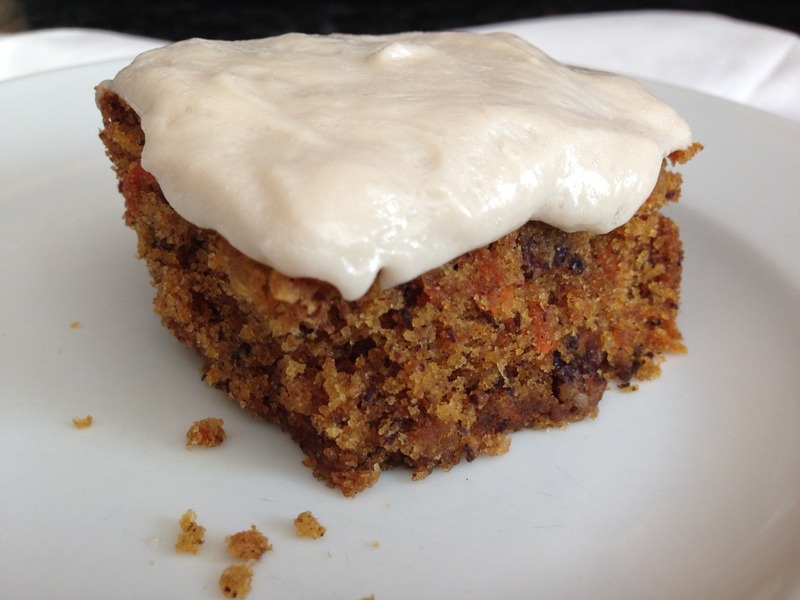 Love, love carrot cake this looks simple enough for me to make for Thanksgiving can I freeze it already frosted? Thanks! Zoe, Sorry that your comment slipped through the cracks and just responding now - I haven't froze it this way, only the cake and kept the frosting refrigerated. I suppose you could by putting it into a large cake box (so it doesn't touch the top of the cake) then wrapping it 3-ply with plastic wrap for up to a month. Hope that helps! so funny that my roommate showed me your blog because she's gluten-free and I'm vegan so we're talking about making some of your vegan / gluten-free recipes together and watching GAME OF THRONES each Sunday with another of your recipes! Welcome to our Sunday nights in Berkeley. Thanks Jessica! 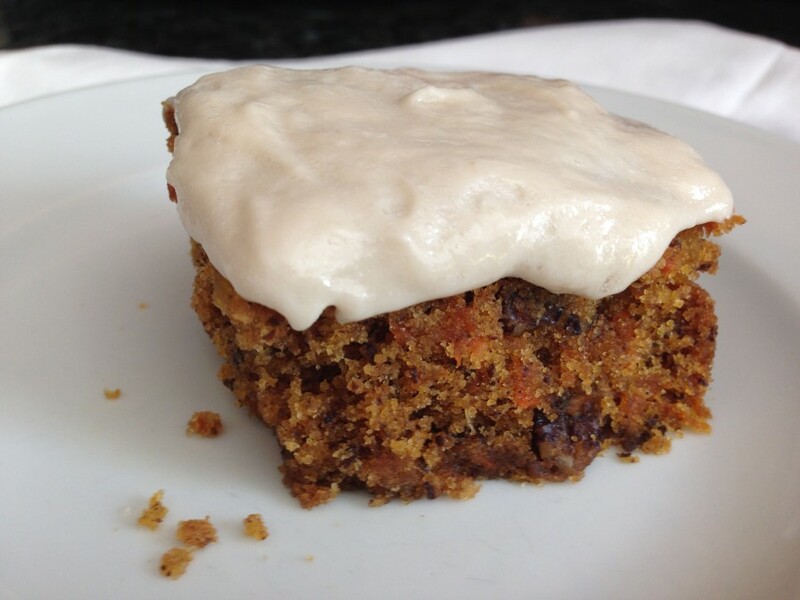 Not much of a pumpkin fan but carrot cake is my weakness. 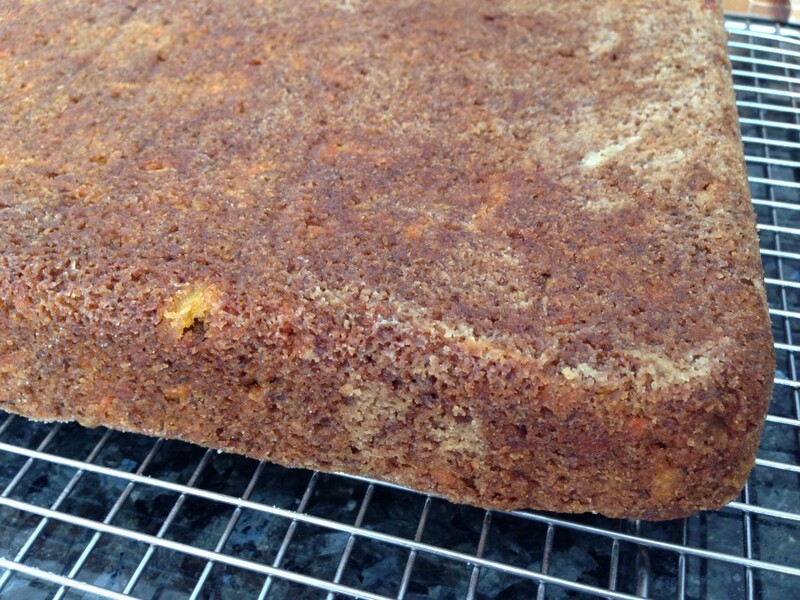 Yours looks outrageously moist for a gluten free vegan recipe. Everyone I find is dry. I look forward to trying your recipe. Daiya cream cheese is to stay chilled? Not sure, thanks. It can remain chilled since it doesn't contain animal proteins that would make say a dairy filled cream cheese rock hard. I think you will love this one as it is not dry. Let me know how you liked it. Enjoy! Looks amazing! I can't eat oats. Do you have another floor suggestion? Would sorghum work? Or more rice flour? Thanks! I suggest replacing the oat for sorghum flour. Enjoy! What a great idea, and a thoughtful one at that! Jessica, I would love to try your recipe and want to know if this will be enough for a 2-layer 6 inch cake? I think my daughter will love it. The batter amount will make two 6-inch rounds but they may be thicker. I would keep an eye on the baking time to see if you need a few extra minutes if they do fill up higher than the sheet pan. Cheers!